As opioid abuse reaches an epidemic level in the United States, programs exist to treat addiction. However, MEDNAX-affiliated physician Roy G. Soto, MD, suggests a better resolution is prevention through education. As a member of the new Michigan Prescription Drug and Opioid Abuse Commission, he hopes to encourage providers to be more conservative when prescribing opioids and patients more restrained in their use. Soto represents Michigan’s medical schools as part of the state’s 21-member advisory commission of cross-disciplinary specialists. According to the U.S. Department of Health & Human Services, more than 28,000 Americans died in 2014 from opioid overdose. The federal government is developing action steps to overcome this crisis, which includes funding for state efforts. Michigan is one of the states that saw a statistical increase in opioid misuse between 2013 and 2014. In response, Michigan’s governor issued an executive order in June 2015 to develop the think tank commission of state experts in law, health, social services and public safety. Soto, a practicing anesthesiologist with American Anesthesiology of Michigan (formerly known as South Oakland Anesthesiology Associates) and a professor of anesthesiology at Oakland University’s William Beaumont School of Medicine, has been broadly involved in issues of perioperative patient safety and opioid use. Through his work with the Michigan Hospital Association, he said, “We’ve learned 40% of the time, patients go to the operating room and no one has even spoken to them about pain.” Soto believes health care professionals can be better trained to suggest alternatives, explain pain expectations, prescribe less freely and more frequently evaluate continued need. He noted dentists are the heaviest prescribers, followed by family physicians and then surgeons. Prior to joining the commission, Soto helped develop patient education materials in Michigan that were sent to medical offices around the state. Patients were advised of the negative side effects of opioids, other options for pain management and the new Michigan take-back program. In connection with the Michigan Pharmacy Association, Michigan had instituted a formal statewide program for patients to safely return unused opioids versus keeping the drugs on-hand for future use or disposing via methods that could contaminate water sources. Soto noted the common practice of patients stowing away prescribed narcotics is a contributing factor for abuse. To support prescribers, Soto also created the Michigan Opioid Safety Score (MOSS): A Patient Safety and Nurse Empowerment Tool, to encourage a more holistic approach to prescribing opioid therapy, especially after surgery. MOSS takes into account a patient’s opioid-related risk factors, respiratory rate and sedation level to help a health care professional assign points for a unique bedside score, and then adjust the patient’s dosages accordingly as the pain subsides. Soto suggests his tool can also be used for non-surgical patients, specifically in regards to frequent assessment. Soto earned his medical degree at Uniformed Services University of the Health Sciences F. Edward Hebert School of Medicine. He completed his general surgery internship at USAF Medical Center and his anesthesiology residency at Ronald Reagan UCLA Medical Center. 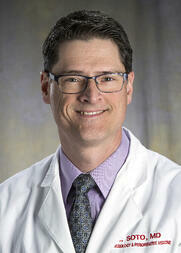 He has been in practice for more than 20 years and is board certified in anesthesiology. He is well published in peer-reviewed journals and book chapters, and is an active educator, researcher and lecturer. The Centers for Disease Control and Prevention defines opioids as drugs used to reduce pain. The classification includes prescription opiates—either natural or synthetic—and heroin. Prescription opiates are legal when administered under the care and observation of a licensed physician; heroin is an illegal substance.